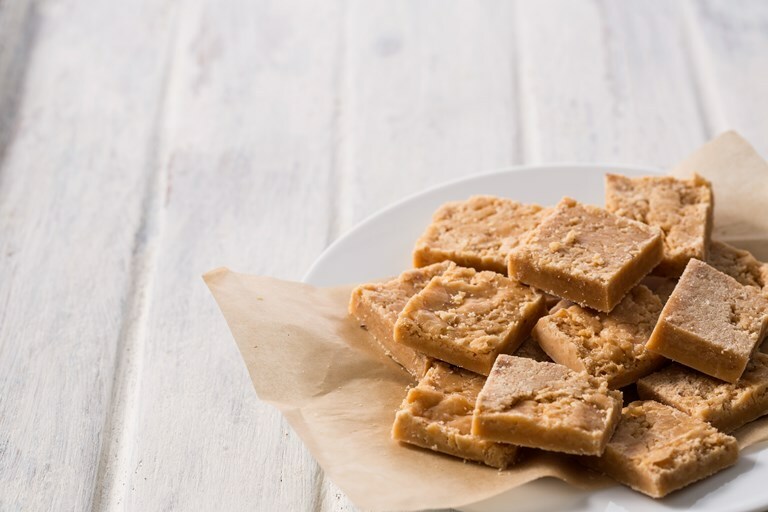 Sally shares her easy tablet recipe – a delicious Scottish variation of fudge. Tablet has a wonderfully crumbly texture and makes a perfect after-dinner petit four or an afternoon treat with a cup of tea. Tablet is the firmer, crumblier, Scottish cousin of fudge. With a high sugar content and rich condensed milk, it may not be one for the health conscious, but then neither is the deep-fried Mars bar... Dating back to the 18th century, tablet was enjoyed by the Scots long before fudge appeared on the culinary scene, although its popularity has waned somewhat in recent years. The key to making great tablet (it should be grainy, but not too grainy) is in the initial dissolving of the sugar, allowing it to melt completely, and in the final beating – just enough to make your arm ache and so that the sugar starts to lose its shine, but any more than that and there is a risk it will completely seize and you'll end up with a crystallised mess, and a lot of washing up!